Might as well talk about since it is still to wet to actually plant any! The longer equipment and farmers sit poised in the start gate the more "tweaking" they find to do to the equipment - but have no fear at a moments notice we are ready to spring (well maybe summer at this rate) into action and rush to the driest field where we will then spend hours lining out what can't be "tweaked" in the barn lot and then we will plant and plant and plant! 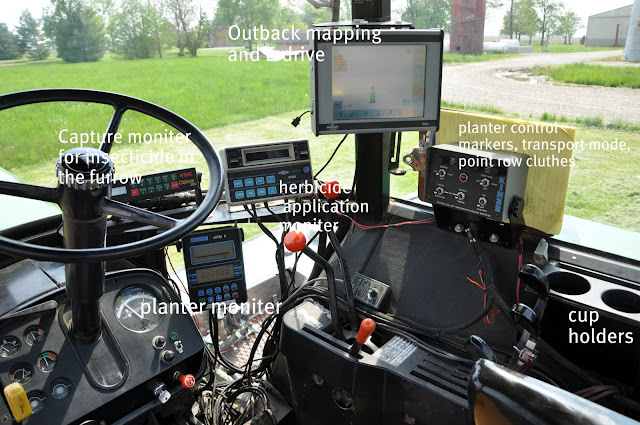 There are so many components to a planter that actually have to be moving and working to be sure they are set right - are all units putting out seed, at what rate, are all the spray nozzles spraying, are they spraying an even pattern, is the monitor picking up all rows, etc. etc. etc. Today was actually dry enough for Chris to bring the planter down behind the house and test it! He had to test in the grassy horse lot behind our house - but it is tested and retweaked! We plant with a John Deere 4630 equipped with an E-Drive and a Kinze 16 row planter - all our corn will be planted with this and some of our beans as well. Finally folded out and testing! Checking that the press wheels are aligned with openers! The inside of the cab - that is a lot of monitors to watch and he has to keep answering his phone because I keep calling and seeing how he's getting along! So we officially have .9 acres of corn in the ground - just not in the right place! So I am knocking on wood that it doesn't rain tonight - notice I didn't say "stop raining" because you NEVER want to do that otherwise it will stop alright - just about the time we really need it! OMG! I am linking up my post to yours! We even have the same planter! Thanks for all the right words I couldn't come up with! We're quite a way behind too, but things have dried out and warmed up and they are running like crazy right now. We even got my one acre of popcorn and sweet corn in the ground. Now if only we could put my fence in so we can plant the beans. I know just what you mean about the stop raining wish. If we could only find a way to store all of this up until July and August. We are in NW Ohio and in a very small area where it is dry enough to plant. Hubby has been working loooonnnnnggggg hours since Thursday and even Sunday (usually takes Sunday off) and is over half done. Keeping fingers crossed the rain holds off and you can soon be planting. that's an amazing machine! hope you can get your seeds in soon! OMGoodlord! That's quite the machine. Our planter is nothing like that. Heck, our tractors are still from the 70's. The mapping device is the guy's ability to see straight! Hope you are out and running today! And you're right: There will be something that needs tweaking after you truly begin. It's inevitable. Good luck! It is critical to have a vegetable planting manage so you can make sure you are planting the majority of the right vegetables in the right zones. There are a few things that your vegetable planting aide ought to incorporate so you can have the most ideal greenhouse. Whether you're planting a couple lines of corn in your greenery enclosure, or a section of land of corn to nourish your creatures and your family amid the winter, you should recall that corn is an overwhelming feeder and will exhaust your dirt if planted in the same spot quite a long time. Indeed, even in the home greenhouse, it bodes well to arrange a yield revolution with corn continually taking after beans or ideally clover. Any vegetables picked up straight from the garden to cook, tastes exotic and this in itself is a prime motivation to grow our own vegetables. Peas definitely have a symbiotic relationship with the nitrogen fixing bacteria and therefore, they are very high in protein content. To add to it they are very tasty as well. Corn will develop best amid summer as it lean towards warm climate. Attempt to plant your corn around 14 days before the last ice and to stop your different assortments of corn shape cross-pollinating each other, amaze your plantings about seven days separated. This will likewise make reaping a great deal less demanding as the corn won't be prepared all in the meantime. If only I have a backyard with that much space - I'd grow corn in it, too! amazing info about planting corn.. i will definitely try it. I appreciate this post and I have learned many things. Your conception is really knowledgeable. I am also agreeing with your conception. John Deere 4630 is the most important thing for the plant. This site also helped me most to learn about…... I have bought this tool; it saves my time and makes easier the hard work. Thank you for your information.